What's dearly earn'd he'll freely spend. 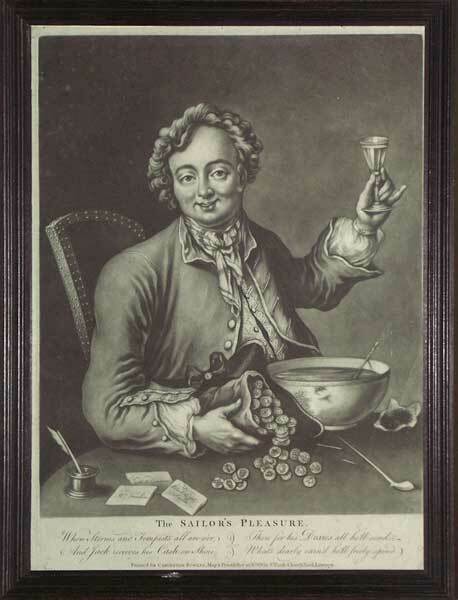 In this delightful print we see a British Tar, back on terra firma and enjoying the fruits of his labours. He raises a glass of punch with one hand and clasps his overflowing bag of prize money with the other. The notes upon the table are addressed to an amusing selection of ladies of ill repute, Moll Common, Mrs Trimhim and Black Ey'd Susan. One can only imagine what fun he has had ashore!